Thousands of people have taken to the streets of the Christchurch CBD to protest a Canterbury water bottling plant. 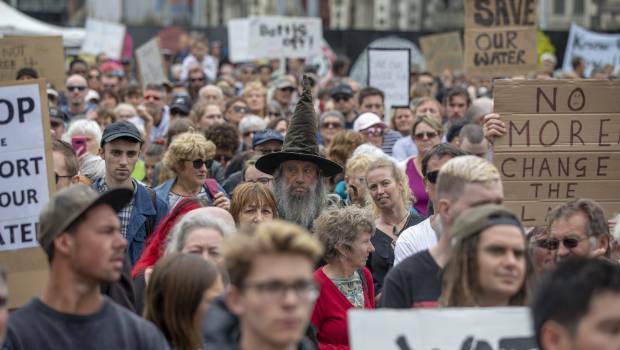 Protesters stretched the length of Cashel St mall, with thousands of people singing and chanting, before gathering for speeches and music at Cathedral Square. Options being investigated by the Government for a tax or royalty on bottled water include a charge on water sold in New Zealand and overseas, possibly of one or two cents a litre. 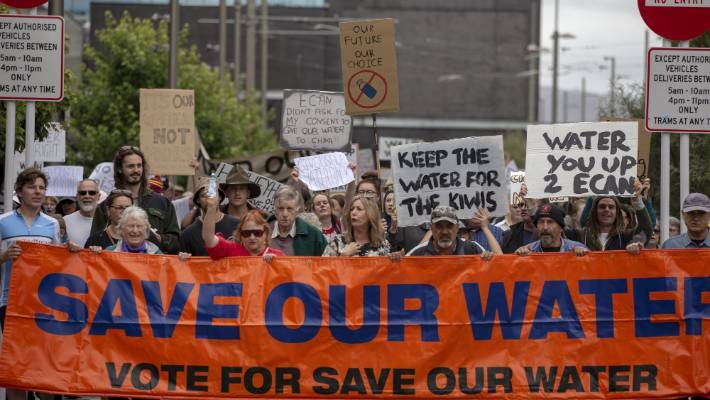 The issue of water exports blew up before the last election, and a large protest in Christchurch on Saturday shows it is still a matter of concern for many people. 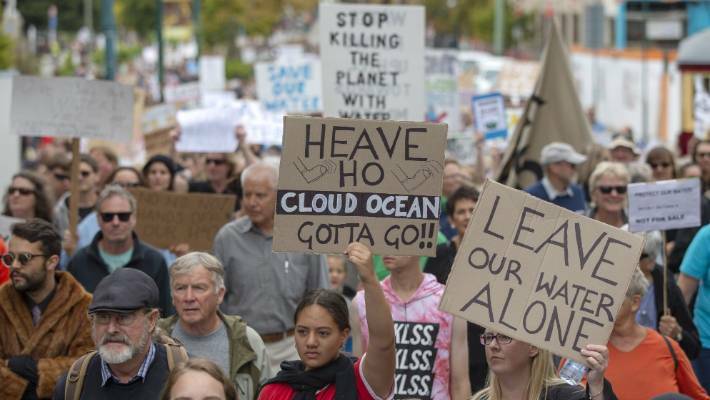 In the Christchurch protest at least 2000 people showed their opposition to a company shipping billions of litres of water overseas. On Monday, Trade and Export Growth Minister David Parker said water bottling companies should be paying something. At least 2000 people took to the streets of Christchurch on Saturday to protest a Canterbury water bottling plant. Asked on The AM Show if foreign water bottling companies were likely to be charged a royalty or tax this term, Parker said: "Yes it's likely. "It's not guaranteed, it's likely but the amount of it, well that depends on whether it's an export only charge - which has to be very low - or whether you charge, you know, a cent a litre for everyone," Parker said. Minister for Trade and Export Growth David Parker: "Maybe a cent or two on every litre of bottled water would be fair too, again it might kick up a bit of extra money for councils and they could reduce their rates, or put it toward cleaning up our rivers for example." "Maybe a cent or two on every litre of bottled water would be fair too, again it might kick up a bit of extra money for councils and they could reduce their rates, or put it toward cleaning up our rivers for example." The Government was looking at the options but there were limits on what it could do. "You can't do it only on exports except for a derisory amount, which would just be recovering process costs, essentially. The issue of water exports blew up before the last election. "And that's because if you do that the international rules relating to trade that bind every country, including New Zealand, say that that acts as a subsidy for internal production. And that's important in other areas, other than water," Parker said. "So if you're going to have an effective tax on the export of water that's actually for a real sum, you've got to do it on all bottled water, including that which is produced and consumed in New Zealand." Many alternatives had been considered, such as whether GST - which was not charged on exports - should be charged on water exports, but that would seem to be a ruse to get around the prohibition on taxes or charges on only exports. 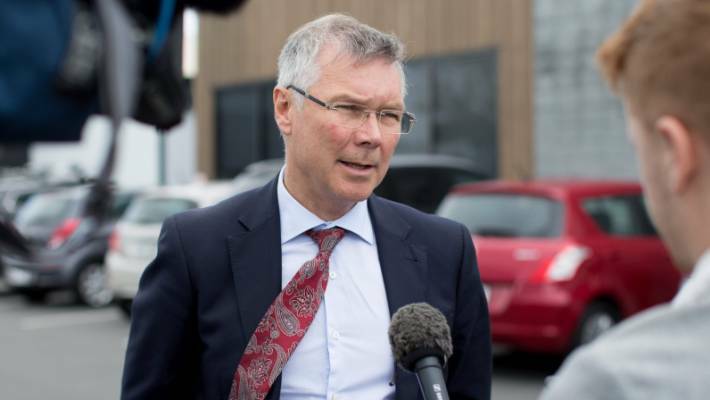 "We can probably impose a royalty if we include New Zealand bottled water as well as exported bottled water but Cabinet hasn't taken any decisions on that yet," Parker said. There was a chance such a charge could be brought in. "I wouldn't rule that either in or out. For me actually the greater problem with all this bottled water is the huge amount of wasted plastic ... On the other hand, occasionally I do buy a bottle of bottled water. "This is a fairness issue about whether the public should get a return from the company that uses this water to make a private profit." At the last election, the Labour Party had proposed a charge on all commercial water takes from rivers and aquifers. "We thought that there should be a return to the public. We were going to give all the money back to the regional councils ... but that didn't survive the coalition agreement," Parker said.